Boy oh boy but I sure hope you like these vintage letter B images. They were used in a variety of academic books, children’s books and other printed materials. This collection of free, downloadable images of the letter B is being offered for downloading here on Reusable Art. Perfect for your webpages, scrapbooking, collages, mixed media art, stationary, ornaments or other arts and crafts projects where you need a single letter B or drop cap B. Selected by a crafter for crafters this collection of images should be perfect for anywhere you require a drop cap letter B. B is for Bear is so obvious to see. 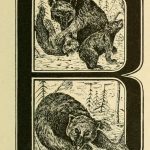 Four lovely bears framed in the loops of the letter B in this vintage woodcut engraving. 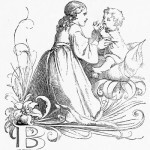 Famous initial letter B from the 1400s. It’s been duplicated in various forms throughout the centuries but this is believed to be the original. 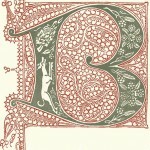 Vintage, 130+ year old letter b with ivy. This letter image is one of several from a book from 1878. It’s in the public domain and ready for downloading. 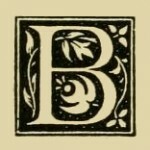 Vintage letter B image used by publishers in the late 1800s. 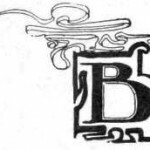 Dainty drawing of a drop cap letter B. Drop cap letter B surrounded by ribbon-like doodles. Vintage drop cap letter B image with sunflower. Black and white fancy letter B image. Black and white drop cap letter B image. Fancy letter B drop cap letter image. Large drop cap letter B image with a beautiful baby. Rubber stamp like block print letter B.